I am choosing to give farm toys this Christmas, rather than wasting time wrestling with online activists and their petition to pull toy livestock trailers from Wal-Mart shelves. I joined the efforts of three agriculture friends to create Farm Toys for Tots. The three friends include a Michigan pig farmer, a Montana cattle promoter and a Wisconsin dairy farmer. They did the leg work of organizing and I got in on the promoting and watching the Farm Toys for Tots campaign take off with support from the agriculture community. Within 28 hours of launching our online fundraising campaign, we reached our $5,000 goal—and contributions continue to come in. We’ve formed a group of “farm elves” to help gather and distribute the farm toys across the country to Toys for Tots locations in the next couple of weeks. It wasn’t until thousands of people starting signing an online petition asking Wal-Mart to remove a livestock trailer from its shelves a couple of weeks ago that I thought about the importance of farm toys. 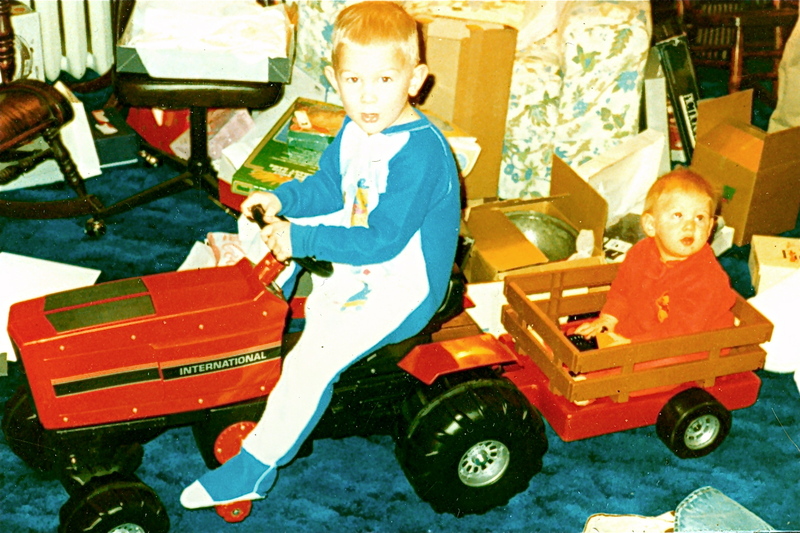 My brother Robbie spent most of his childhood playing with farm toys, which included ninja turtles driving tractors. Robbie is now the next generation on my parent’s farm. Despite what the activists said in their online petition, livestock trailers move animals from spring pastures to home and back again, to county and state fairs and, yes, eventually to a feed yard, livestock market and/or processing facility. My brother Robbie “farming” on Christmas Eve 1987 with my sister as his passenger. I see semi-trucks and livestock trailers daily on our rural highways in south-central North Dakota transporting cattle to weekly auctions or between pastures. My young daughters know about food animals and where their meat comes from because of their exposure to farm and rural life, which includes livestock trailers. My daughters dig out the old farm toys at my parent’s house and they “farm” themselves at home with their pink tractor. 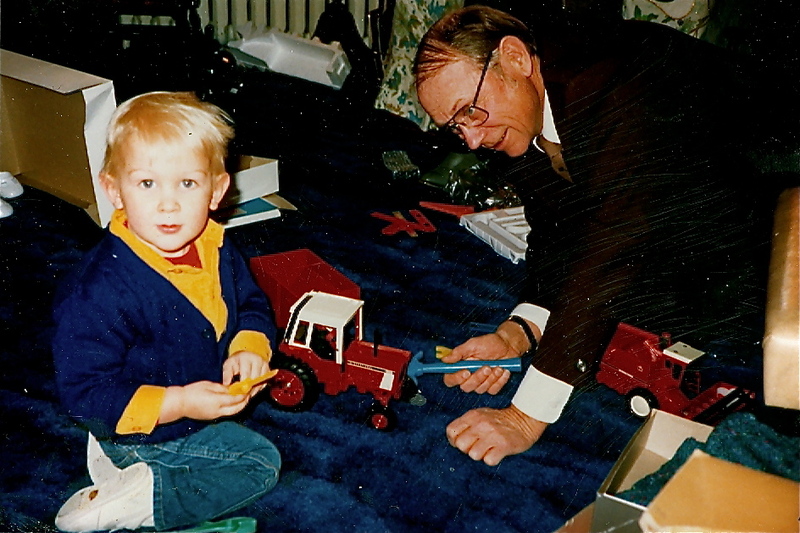 Our son spent years playing with farm toys, and now he enjoys helping his grandparents every chance he gets. A few years, ago during the children’s message at church, our pastor asked each child what he/she wanted for Christmas. An excited young boy raised his hand and shouted, “A manure spreader!” Chuckles erupted from the congregation. I will always remember his sincerity and passion for a toy manure spreader. Why are farm toys valuable? They spark passion—lifelong passion in agriculture. They shape a next generation in agriculture. We look around sometimes and wonder where the next generation is going to come from to transition our farms and ranches. After all, the average age of the American farmer is 60 years old. The next generation might be carpet farming, but it’s up to you and me to make sure we empower and encourage passion in the next generation, no matter how young they are. Passion for farming and ranching can start on the living room floor. Robbie is living proof! 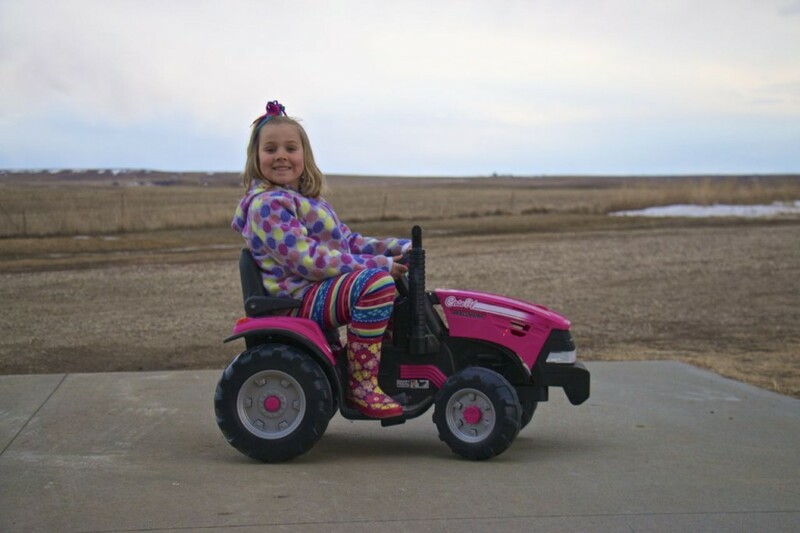 Inspiring a love for farming and agriculture can start with you and me giving the gift of farm toys to kids in our area. We can make sure all of the kids in our family have a tractor, a livestock trailer and farm animals to play with on their living room floor. Rather than complain about a group of activists trying to pull farm toys from store shelves, give the gift of farm toys this season. I think my small-town hardware store, drug store, western shop and two machinery dealerships all sell farm toys. You don’t have to shop at Wal-Mart to give the gift of farm toys. But if you do visit a big-box store, buy a couple of livestock trailers to kindle passion in a next generation of agriculture. To learn more about Farm Toys for Tots, visit facebook.com/FarmToysForTots. This originally published as my Agweek column.